Support the South March Highlands at the Canadian Tribute to Human Rights monument (in front of City Hall on Elgin St.) on Thursday July 28 at noon. Speakers include Sierra Club of Canada President John Bennett and Kurtis Benedetti, a 23-year-old Ottawa resident who is arriving home after cycling from Cape Breton to Ottawa – 2100 km – to raise awareness about the South March Highlands. Organisers will also read messages from Order of Canada recipient Grandfather William Commanda, Greenpeace and other supporters. After the rally, people are welcome to ride with Kurtis for the last leg of his journey, to the South March Highlands (about 20 km). World Heritage Site. Algonquin Nations have been vocal in calling for a new comprehensive archaeological assessment of the area. Despite being officially declared as Environmental Area in 1970 and officially “protected” for more than two decades, only a third of the original South March Highlands remains….In 2011, the International Year of the Forest, with the blessing of the Ontario Municipal Board and Ottawa’s newly elected City Council, developers clear-cut a large portion of the area known at the Beaver Pond Forest. Despite the loss, some 15,000 Canadian citizens, First Nations and organizations vow to continue the fight to save the remaining South March Highlands.” For more information: http://www.union-algonquin-union.com/south-march-highlands/, http://southmarch.wordpress.com/ and http://www.ottawasgreatforest.com. 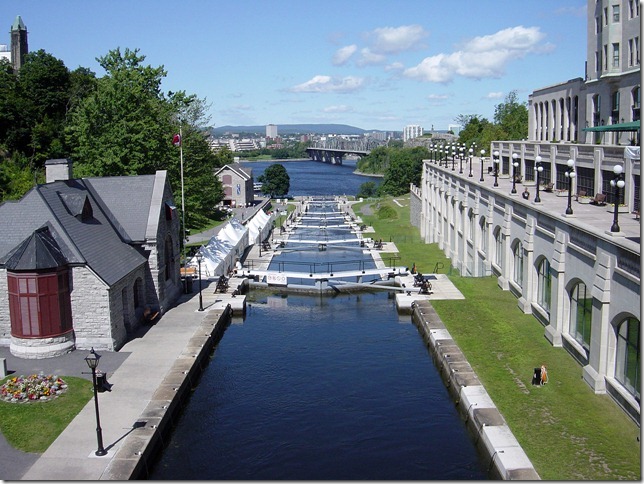 The Rideau Canal Festival takes place July 28-August 1 at several spots along the canal including Confederation Park, the Ottawa Locks (at Bytown Museum), and Dows Lake Pavilion. The Festival is a celebration of the Canal, a UNESCO World Heritage Site, and features a range of activities. New this year are an art show and world heritage concerts (which include environmental storytelling for children), and a Bicycle Chic fashion show. Admission applies to some events. As part of the Festival, the Energy Ottawa Ecosphere Environmental Fair takes place starting July 30. This “environmental and green building fair” is organised by Group Ecosphere, a non-profit organization, and includes exhibits from companies and organisations about green building, new technologies, organic farming, alternative medicines and other services. For more information: http://www.rideaucanalfestival.ca/index.html and http://www.projetecosphere.org/en/index-ottawa.php. Pinhey’s Point Historic Site has a Campfire and Storytelling event on July 29 at 7:00 p.m. Gather around the campfire, roast marshmallows and listen to First Nations stories and legends. Reservations required; cost is $6 per child, $10 for two or $16 per family. For more information on this and other great local museum programming: http://www.ottawa.ca/residents/heritage/museums/index_en.html. Sounds like you’re having a lovely time, while we in the NY/NJ area are dealing with urban bullying from non-stop migration from down south of the border and Italy, and News of US military casualties. It seems Canada does a much better job of maintaining borders than the US, because of its green standards. SOS: If talented landscape designers and environmentalists can come down here and help with greening the urban environment, it would be much appreciated. Suggestion: Having as many Hispanic/Italian/North Africans do their environmental studies in Ottawa, either by tourism or in class. Hopefully, providing such open education will help alleviate the urban migration, and bullying problem that is allowed to spread throughout the state of NJ and other areas (schools) in the Northeast. What I like about Ottawa and Canada is that it provides the same access to green standards for everyone. Thus problematic behavior due to the environment, such as urban crime is done away with.